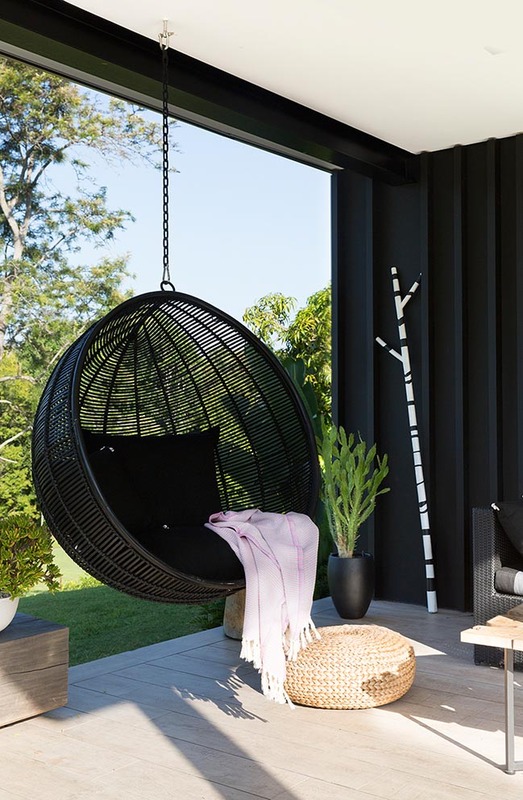 Sarah Waller has carved a career designing and building houses for other people, yet a move from the UK to Australia offered her the opportunity to design and build something unique for herself and her family - their own iconic home. 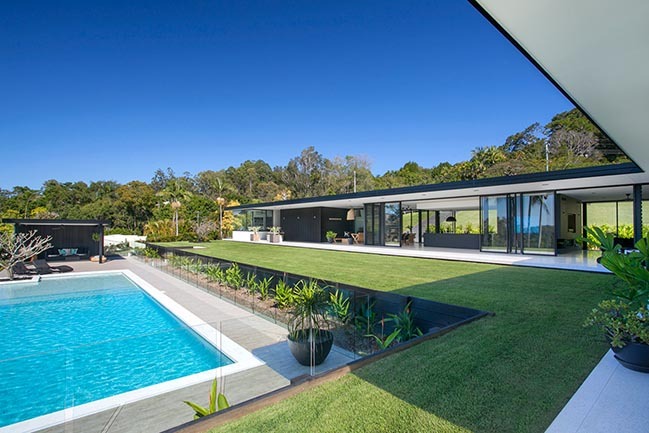 From the architect: With her extensive design background and expertise as a licensed builder Sarah embraced the creative freedom to create a home inspired by the simplicity and sophistication of mid-century modern architecture. 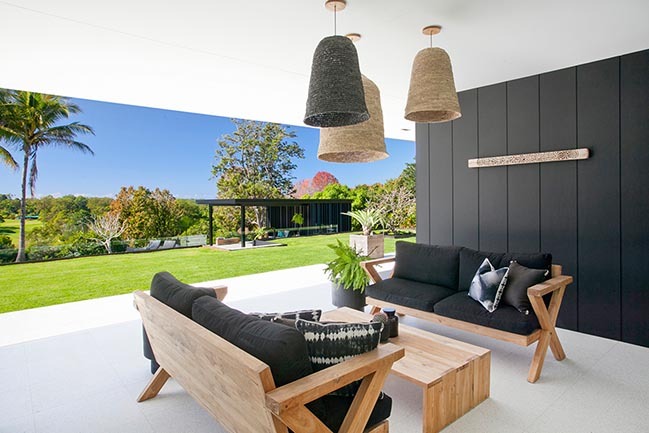 Intrinsically involved in every step of the process from the design and build, through to the final styling and decorative touches, Sarah's home pairs beautiful form and function. 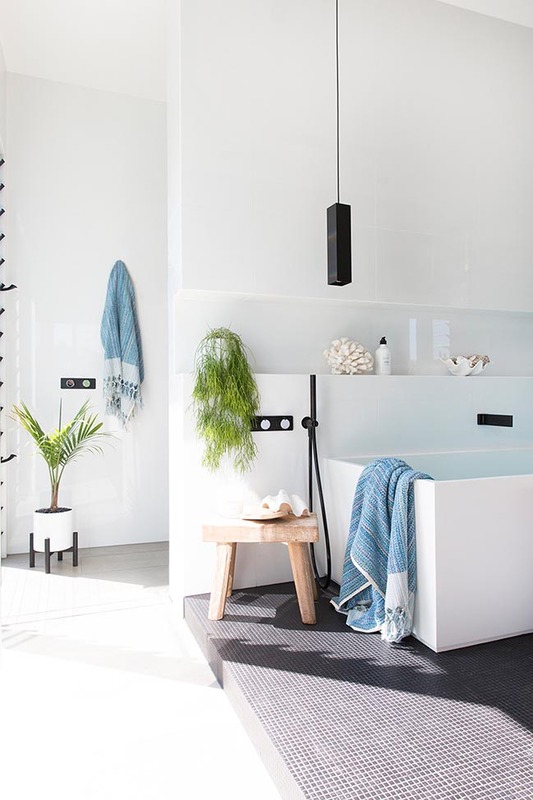 "To manage the entire process and bring it all together is incredibly satisfying and now we're living and experiencing the home, you get a true appreciation that beyond its aesthetic qualities it has a wonderful feel. 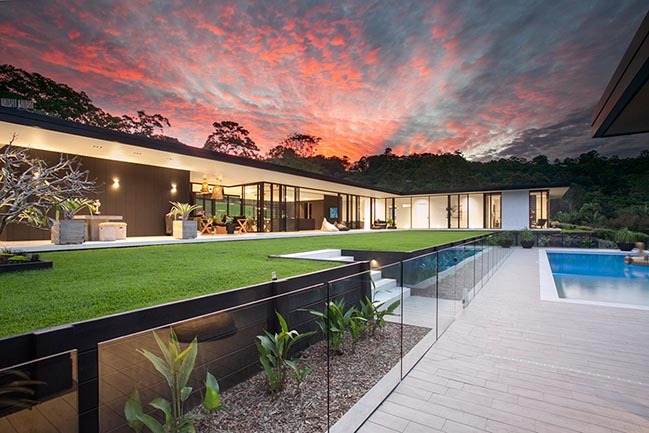 Sometimes I have to pinch myself it's ours." 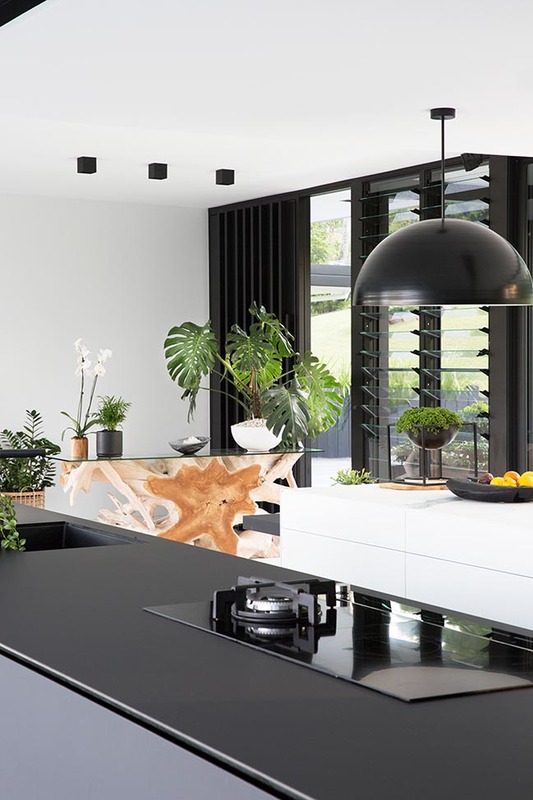 Kitchen - A restrained palette and clean lines define the minimalist kitchen which pairs functionality with striking sculptural form. 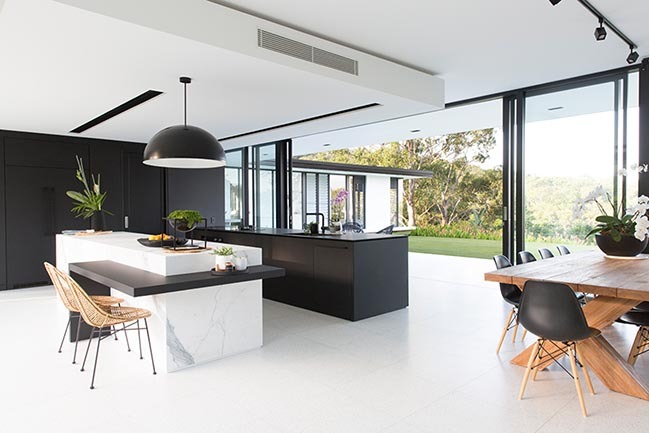 Generous island benches in fine matt black laminate and marble-look porcelain, punctuate the open plan layout and reflect the linear monochrome feel throughout. 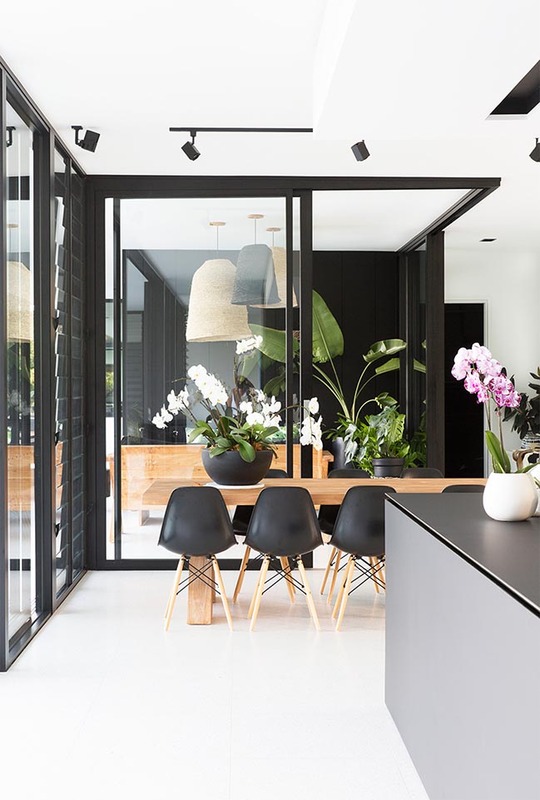 Kitchen Storage - The inner workings of the kitchen are cleverly contained within a deceptively cavernous black box clad in nanotech FENIX, where open shelves, additional bench space and a butler's sink are convenient yet out of sight. 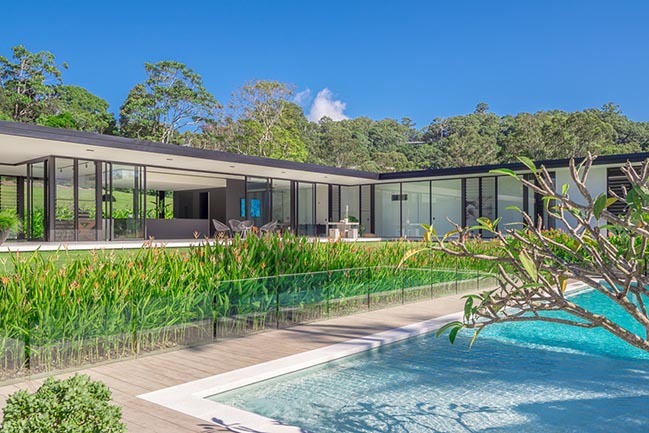 Luminous Appeal - Walls of glass spanning the length of the home, blur the distinction between indoor and outdoor spaces and allow an abundance of natural light to stream through, imbuing warmth and unimpeded views of the verdant surrounds. 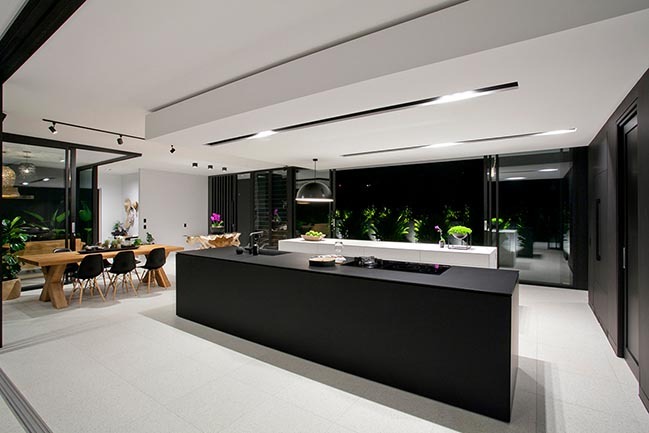 A mix of concealed task lights and custom designed feature pendants form the layered lighting scheme which creates ambience at night with a flick of a switch. 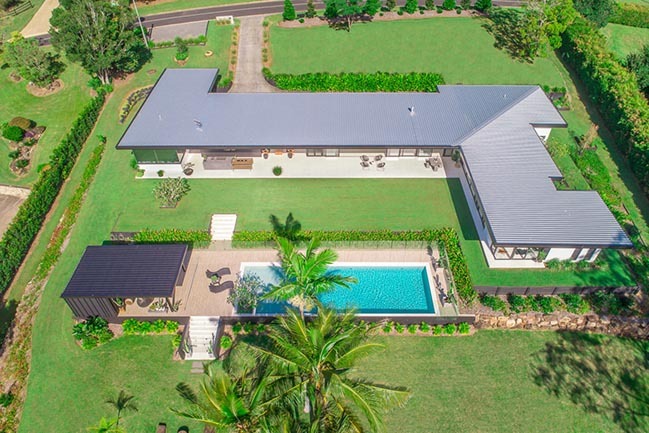 Inside architectural features are beautifully illuminated, while outside soaring coconut palm trees and architectural frangipanis are up-lit amongst the landscape. 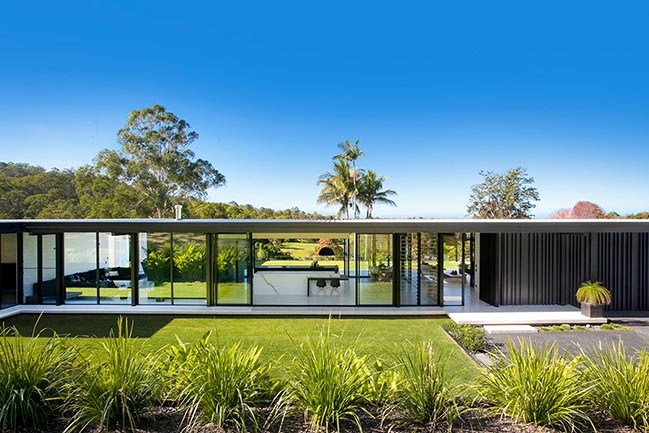 Bedroom - Enveloped almost entirely in glass, the expansive outlook provides an ever changing view from the master bedroom. 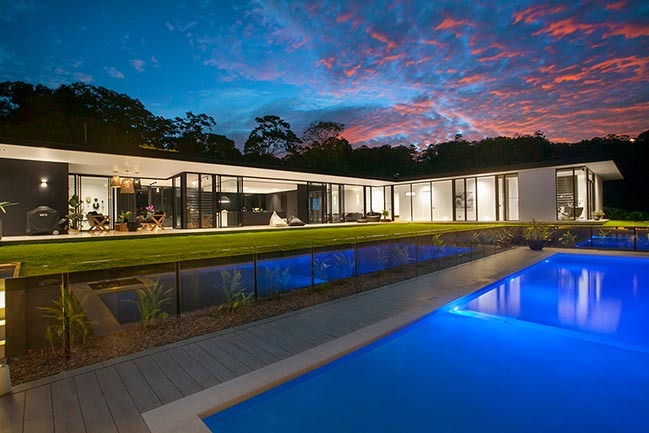 "I love that you have all the comforts of indoors, yet you really feel part of the landscape. 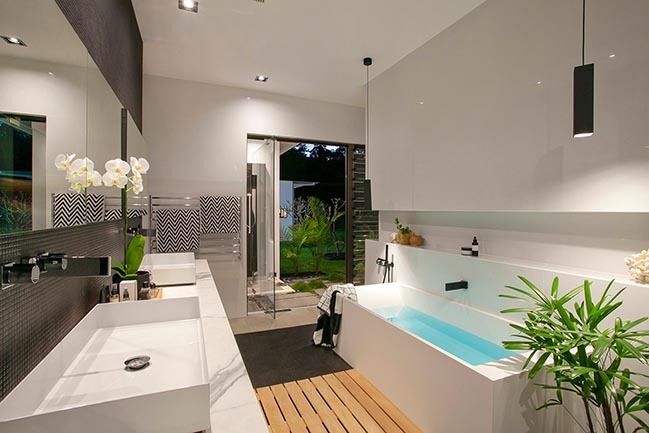 We wake up with the sun and experience the subtle changes in weather throughout the day." 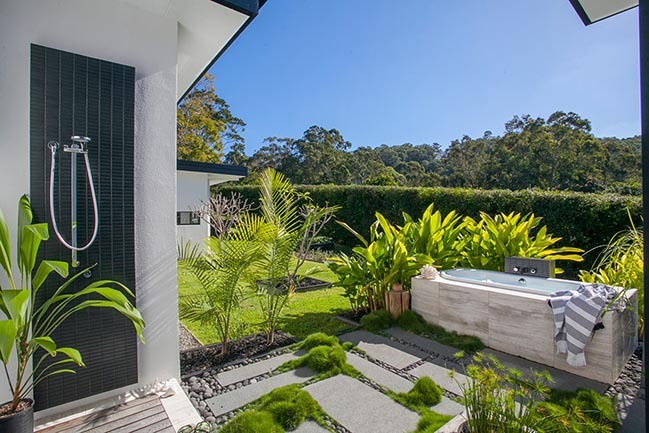 Bathroom - Indulgent bathing options from the award winning monochrome master bathroom extend to the outside, where a deep free-standing bath secluded by greenery adds to the home’s relaxed holiday feel. 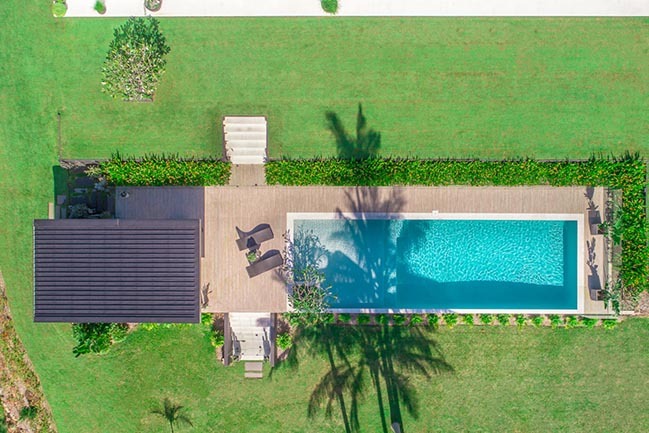 Outdoors - A tropical feel pervades the lush landscaping which envelops the house and steps down the tiered block to create a resort-like feel poolside. 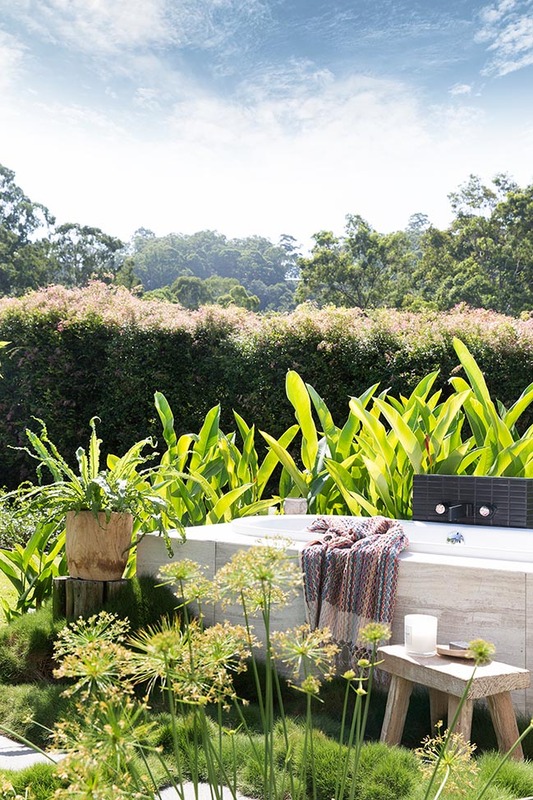 Simple mass tropical planting with uplit feature trees are the basis of landscape design. 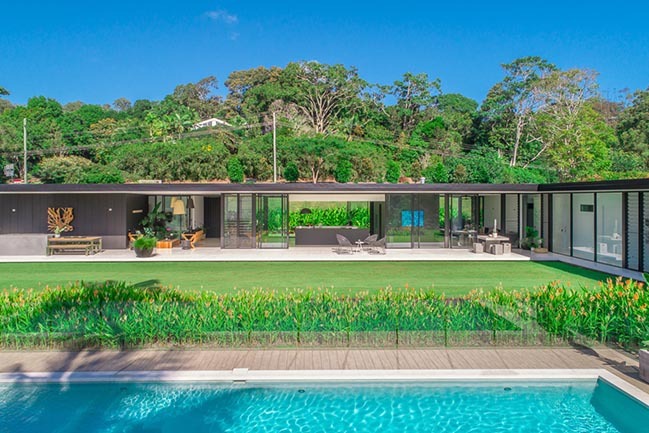 Pool and Cabana - Taking style cues from the Modernist Palm Springs pools popular during the '50s, a similar look is evoked with a streamlined resort style linear pool, offset with a chic cabana furnished with casual pieces ideal for relaxing and soaking up the sweeping views. 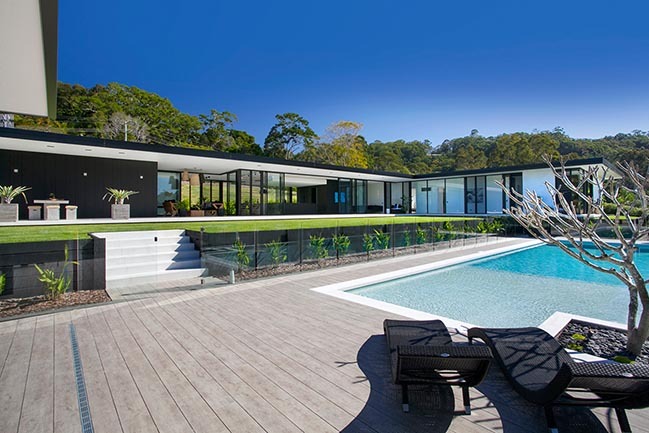 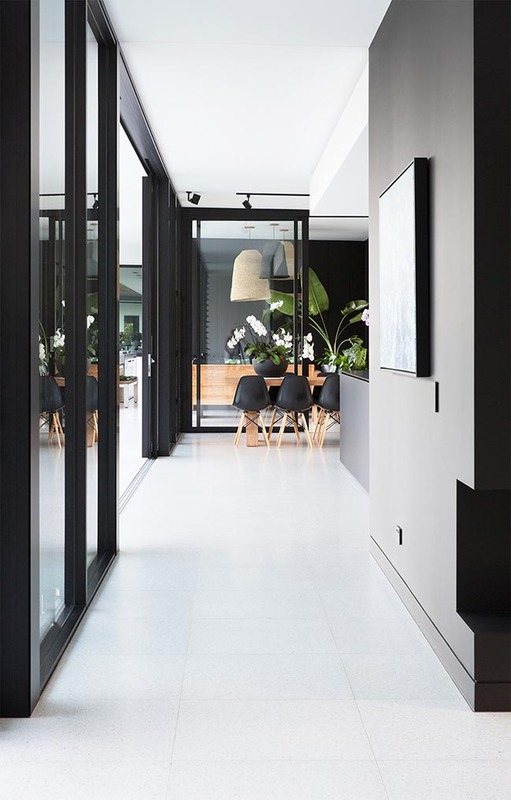 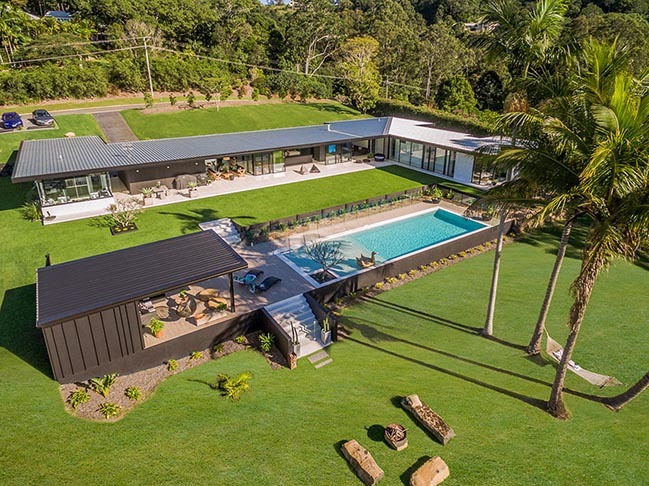 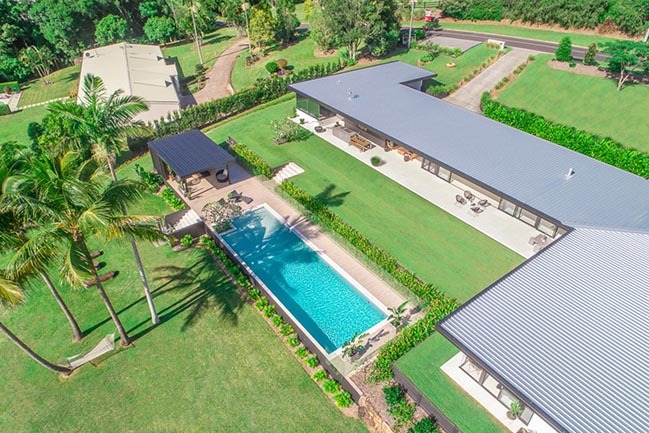 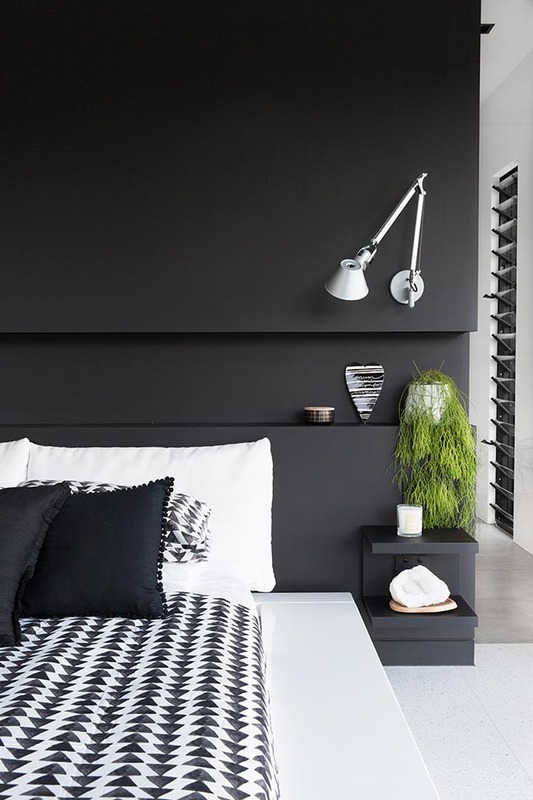 The Palette - The home's minimalist appeal is accentuated with a timeless black and white palette inside and out, with texture introduced with plants, the warmth of timber and tactile surfaces such as the white terrazzo floors which flow throughout.